The findings are a bit daunting: in one survey at the University of Colorado Hospital, nearly nine out of 10 nurses met criteria for Burnout Syndrome — emotional exhaustion, detachment, and poorer cognitive function and work performance. Nursing Times also reports that more than 60 percent of nurses say they’ve had work-related stress and side effects like physical or mental health problems in the past year. The consequences of BOS don’t affect only nurses. Burnout from short staffing, for example, can lead to health care problems such as urinary tract and surgical site infections. In fact, hospitals that cut burnout by 30 percent saved up to $68 million annually because such infections were reduced, a University of Pennsylvania study found. 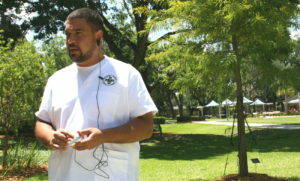 Christopher Day, VBSN sophomore and 11-year U.S. Navy veteran, 32, tries out the emWave2 biofeedback device that helps users regulate stress and anxiety. It is used in JU’s Veterans Bachelor of Science in Nursing program that helps veterans transition to higher education. To top things off, with chronic conditions like diabetes and obesity on the rise, a higher emphasis on preventative care, and aging Baby Boomers in need of more medical attention, a shortage of RNs has escalated. 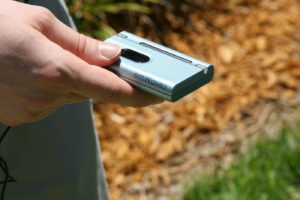 It is squeezing already-stressed healthcare professionals even more. That’s despite the fact that employment in the field is expected to increase 19 percent from 2012 to 2022, faster than the average for any other occupation, according to the U.S. Bureau of Labor Statistics. The Keigwin School of Nursing at Jacksonville University is working to address these challenges with new tactics and curriculum designed to help students better prepare not just for the professional demands of their chosen career, but for the personal and emotional ones as well. This effort to help students manage stress while in school is also designed to aid them once they are in the field. Bullying, nurse burnout and fatigue clearly can contribute to patient safety issues and negative health outcomes, said Dr. Teri Chenot, Associate Professor in JU’s Brooks Rehabilitation College of Healthcare Sciences. 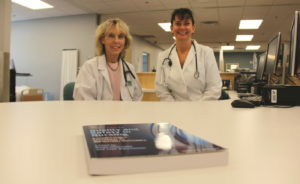 She and Dr. Roberta Christopher, Assistant Professor, are co-directors of the new QSEN Institute Regional Center at Jacksonville University, whose goal is to foster an international network of nurses and other healthcare professionals who contribute to quality and safety educational resources and scholarship. The center’s inaugural 2017 Patient Safety Forum on Friday, June 9, will feature internationally known speakers who will address the evolution of patient safety and include strategies to cultivate a more positive work environment to address these issues, Dr. Chenot said. More information about the Center and the Patient Safety Forum is available by contacting Dr. Chenot at tchenot@ju.edu or Dr. Christopher at rchrist6@ju.edu. Dr. Chenot has conducted the first known research on nursing students’ perceptions about their awareness, skills and attitudes regarding patient safety with the development of the Healthcare Professionals Patient Safety Assessment Curriculum Survey (HPPSACS), which is now globally utilized. In addition, Dr. Christopher, Program Director of Health Informatics, is advancing awareness of conditions associated with stress and burnout. She recently conducted research that suggests nurses’ perceived lack of engagement in the nursing process may negatively influence their quality of nursing care. 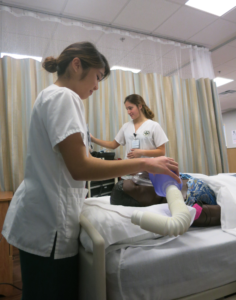 JU Nursing students in the Simulation Training and Applied Research (STAR) laboratory in the Keigwin School of Nursing. One of the ways nurse anxiety and pressure can be addressed is by reproducing the conditions correlating with those experiences in a controlled atmosphere, said Dr. Chenot. The QSEN Institute Regional Center monitors that by using the Brooks Rehabilitation College of Healthcare Sciences’ state-of-the-art Simulation Training and Applied Research (STAR) laboratory. Rashell McFarlane, who earned her Bachelor of Science in nursing from JU in 2016 and now works as an RN on the urology transplant floor of UF Health Shands Hospital in Gainesville, agreed that her job entails a high amount of stress. The Keigwin School of Nursing did an excellent job preparing her mentally for the field, McFarlane said, because the faculty were understanding and guided the students in what to watch for when they graduated. With the relentless interactions and distractions from multi-tasking and social media, nursing students may find that they are not able to concentrate when studying or to pay attention in the classroom, according to Dr. Bobbi Logsdon and Dr. Pam Rillstone of the Keigwin School of Nursing. With that in mind, the pair are using mindfulness activities to help students “be in the moment” and focus on the present, eliminating some of the extraneous factors that can be distracting. “These mindfulness activities can help students relax and focus on the present moment and current information, as well as help to alleviate tension and anxiety,” said Dr. Rillstone. Dr. Rillstone, a psychiatric mental health nurse practitioner, facilitates ongoing support group sessions for JU nursing students to explore issues they are having with school and work-life balance. 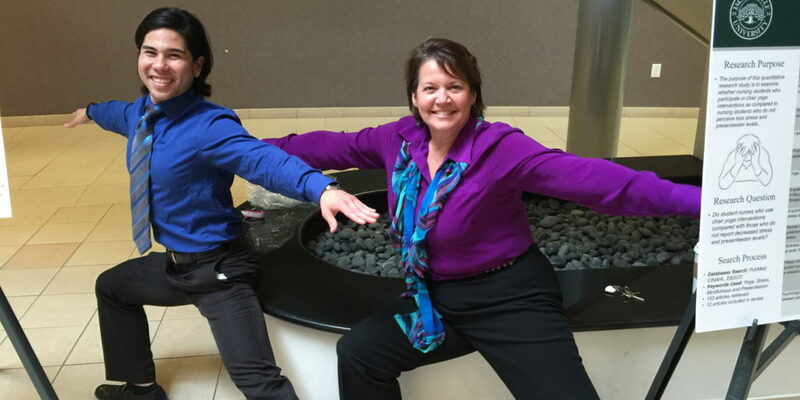 Meanwhile, Dr. Logsdon is promoting yoga and meditation as forms of relaxation in both the clinical and classroom setting, to help deal with nursing stress and burnout. Dr. Rillstone, along with Professor Pam Swan, who also teaches psychiatric mental health nursing, are planning a Healthy Living day camp from July 31 to Aug. 4. This camp is geared for students ages 11 to 14 to help incorporate many of these mindfulness techniques at an early age. A major Health Resources and Services Administration (HRSA) grant for veterans in the Keigwin School of Nursing at Jacksonville University has had a domino effect on the campus to ensure the success of military nursing students to enter their chosen career field of nursing. 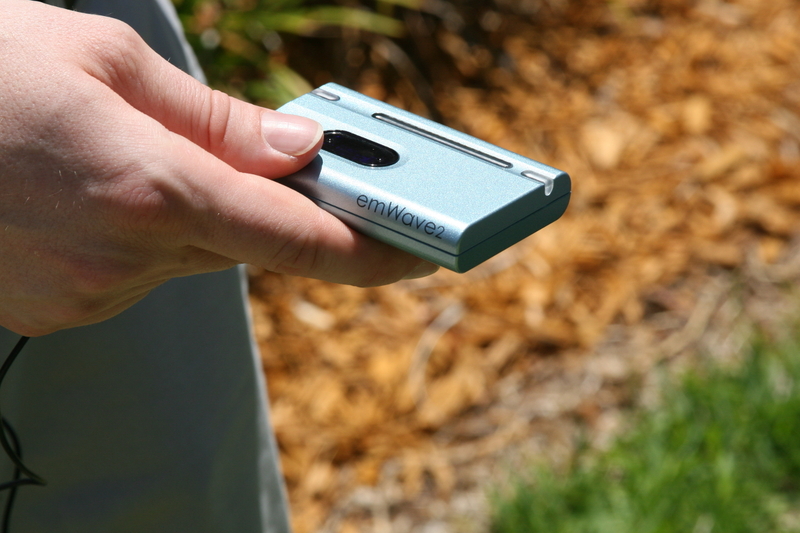 The emWave2 biofeedback device to help users regulate stress and anxiety, developed by the Institute of HeartMath and used in JU’s Veterans Bachelor of Science in Nursing program. The device and HeartMath software teach users skills and mental tools to manage their body’s physical responses with maximum efficiency. To help veteran students achieve their goals and graduate from the Veterans Bachelor of Science in Nursing (VBSN) program, they can train in HeartMath. With decades of research into building resiliency, optimal performance and addressing stress, this biofeedback-assisted stress management program focuses on building and enhancing resilience and self-regulatory skills. “Think about HeartMath as a way to visualize the internal activation of our body’s response to stress, in real time,” said Kyle Fessenden, a Licensed Mental Health Counselor, Certified HeartMath trainer and VBSN program counselor. With some basic understanding of how the stress response works and its impact on performance, HeartMath teaches users skills and mental tools to manage their body’s physical responses with maximum efficiency. 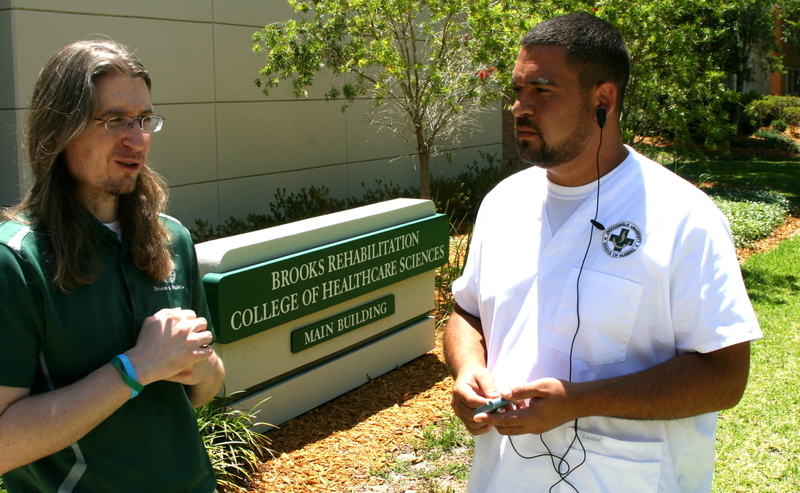 Kyle Fessenden, left, a Licensed Mental Health Counselor, Certified HeartMath trainer and VBSN program counselor at JU, talks about the emWave2 with JU student-veteran Christopher Day. 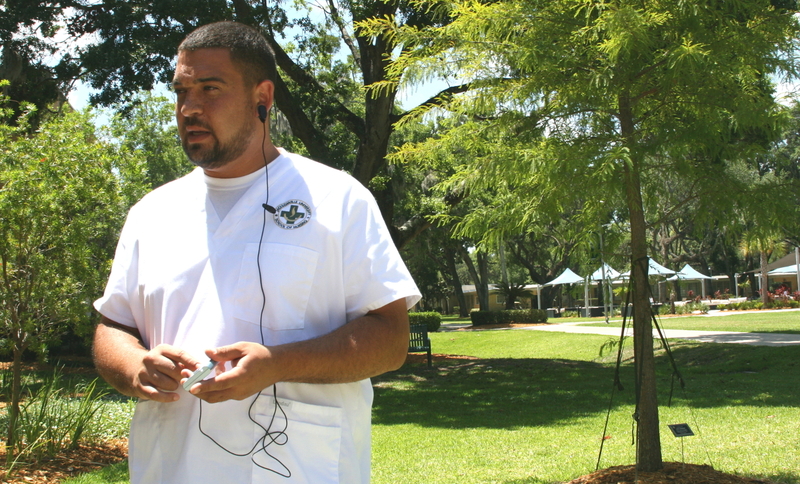 Christopher Day, a VBSN sophomore who served in the Navy for 11 years from 2005 to 2017, said he appreciates JU’s attention to students’ lives, both in and out of the classroom. Tutoring resources are offered as needed for veteran nursing students and are identified in the personal counseling they receive by Program Director Dr. Lynnette Kennison and other faculty members who reach out to these students. Veterans and students in JU’s Navy Medical Enlisted Commissioning Program (MECP) are also offered access to PassPoint, a fee-based, multifaceted learning resource to help them succeed on the National Council Licensure Examination for Registered Nurses (NCLEX-RN). BSN graduating students are given codes to activate their personal accounts during their senior year. The codes are available for 12 months from the date of activation. The real-time performance data allows the students to identify their own strengths and weaknesses before taking the test. Recently, Dr. Kennison and Fessenden were trained in a new therapy called Accelerated Resolution Therapy to help veterans resolve trauma issues and even reduce anxiety. It is now available at JU for veterans who carry trauma memories or have anxiety issues with exams or other stressors. The HRSA grant has complemented other JU programs for success for all military students. “Green Zone” training is provided to all faculty, staff and administration by Brigadier General (retired) Mike Fleming, Senior Vice President for University Relations and Development at JU, to assure a baseline of knowledge about military service. In addition, the University’s Defender’s Den is a resource only for military students and provides computers, camaraderie and food provided by the USO. As a JU graduate and current faculty member, Clinical Assistant Professor of Nursing Amber Santos has first-hand knowledge of what sets JU apart from other nursing programs. An example of this is the NCLEX pass rate for JU Nursing graduates of 100 percent for the first quarter of 2017. The NCLEX is an extremely high-stakes exam, and many times causes recent graduates stress, Santos said. A few years ago, JU Nursing faculty noticed that students who did not pass the exam on their first attempt had one thing in common: extreme anxiety about passing.